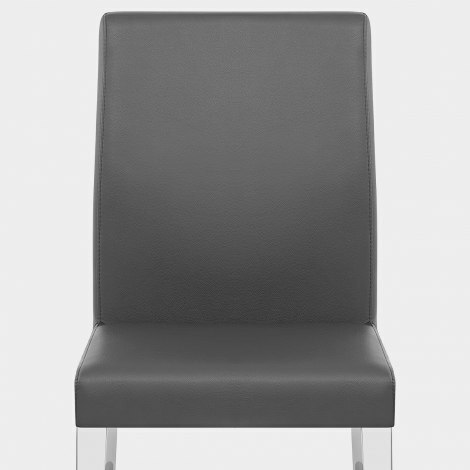 The Dash Dining Chair Grey is a smart and minimalist piece of furniture with several functional and fashionable features. A real delight, this modern design will add a dash of simple yet chic style to your kitchen, dining area, or dressing table. Delivering a cool and crisp aesthetic, grey faux leather upholsters the seat and is totally on trend. Padding within the seat creates complete comfort, with a tall backrest lending additional support and luxury. Four mirrored chrome legs form the sturdy frame, each with a tapered rectangular design that is substantial and stylish. Finished with protective floor plugs on each leg, it is practical too. "The chairs are beautiful and very sturdy"
Look more expensive than they are. Nice colour and modern looking. Would recommend! These arrived really quickly. Good communication re delivery time. These are good quality,stylish and comfortable. A nice light grey and look like real leather. Very happy with this company's service and its product.